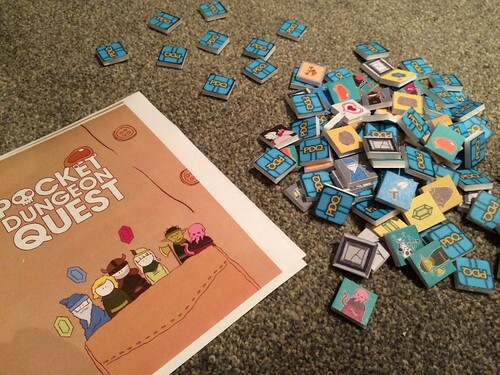 Pocket Dungeon Quest (or PDQ) is a short, simple game which should be easily playable with younger children created and designed by Jeff Dehut. It is a collaborative game, but like any dungeon adventure, there is a risk that your hero may die. 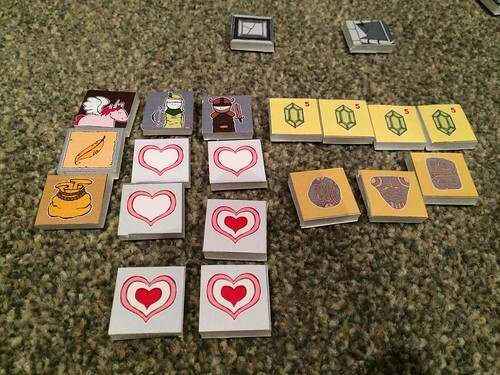 The game has recently finished on Kickstarter, where I backed the Print & Play (PnP) version for $5 as the shipping to the UK was somewhat eye-watering. 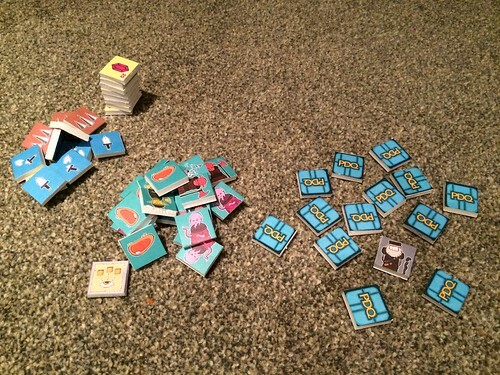 You can buy the PnP for slightly more ($8) on Gumroad here (https://gumroad.com/l/PDQgame). It took about 30 minutes to mount the game on 5mm foam board using 3M Spray Mount and cut it out. The artwork in the game has a gorgeous playful cartoon style, giving it real character and making it far more child-friendly. 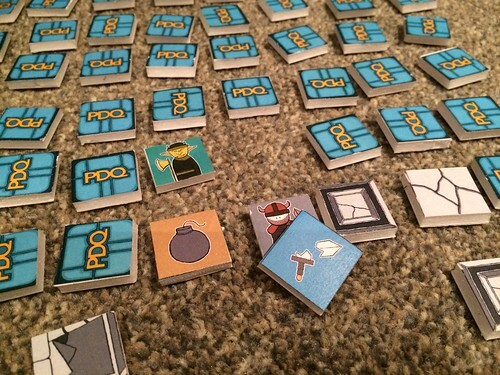 The PnP has four different characters that you can play - the Warrior, the Rogue, the Archer and the Wizard. The Kickstarter had an extra Hero (‘the Adventurer’, an Indiana Jones style character) which won’t be available anywhere else, not even on the PnP file for backers. Each Hero has a special feature; the Warrior does more damage; the Rogue can steal items and use them before fighting a monster; the Archer can re-roll their attack and the Wizard can use two spells or items per turn rather than one. 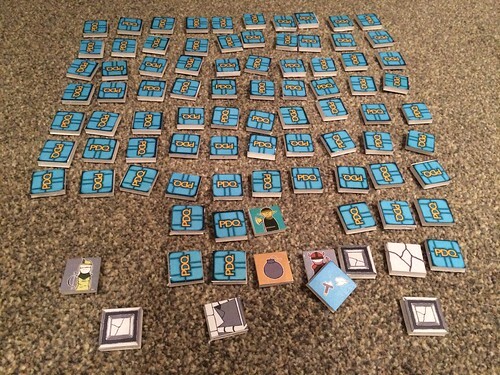 The core of the game is a 10 x 10 matrix of tiles which represent the contents of the dungeon that you are exploring. The tiles include walls (blocking movement), floors (no real effect), spike traps (doing a point of damage), monsters of various types, the dungeon boss, items, spells, bonus/penalty effects for combat, the Pegasus (flies over walls), gems, the Merchant, and three Relics. The Heroes all start at the edge of the matrix and the turns are very simple. Move, turn over the tiles that you can see (effectively all the unturned tiles adjacent to you). If a monster (or monsters) are revealed, you must fight them before you can grab any loot (items, gems, spells and so forth). Combat is made with a modified d6 with the following results. 1. Red Skull - critical miss, you lose a health point and suffer an additional effect based upon the monster you are facing. 2. Yellow flash - you lose 1 health. 4. 1 Sword - this doesn’t kill the monster, but you don’t lose health. If you’re a warrior then you get an extra sword so this will be a kill. 5. 2 Swords - kills any monster with a direct hit. Can be reduced by a broken sword effect back down to 1 sword. 6. 3 Swords - kills any monster, even with a broken sword. Assuming you kill the monsters, you can take an item from those that you have revealed, and all the others go face down into a discard pile (separate from the discarded monsters). When you turn over the Merchant’s tile, you can exchange 30 gems to buy tile (item or spell) back from this pile. Two tiles are turned over and you choose one of them. A bad thing is when you reveal the boss. At that point, the party rolls to see how many henchmen he has. These are drawn from the monster discard pile or by revealing tiles on the dungeon if there are not enough monsters discarded. You have to fight your way to the boss through the henchmen to kill him. If the party is down on health then this can be pretty nasty. 1. Find all 3 relics and exit the Dungeon in one piece. 2. Kill the boss and escape the Dungeon alive. 3. Clear the floor, revealing all tiles and killing all the monsters. Before I tried this with Nathan, I had two quick tester games. In the first game, I had two Heroes in play, and found the Boss very early after some poor rolls in the first few turns. The four henchmen that he came with were too much much for the poor Heroes who had already been injured and had very little in the way of items or spells. They managed to kill three of them before they all died. The surviving Heroes at the end of the second game. From left to right: traps, sword effects, gems; pile of dead and escapees; Merchant and his wares. In the second game, the one of the two heroes (a Rogue) died on the first turn when she turned over three tiles including a Minotaur that did 2 health damage on a critical miss. Ouch. She couldn’t heal herself in the combat (as no-one had a healing potion and the Warrior didn’t find the Phoenix Feather spell to resurrect her) and so was gone. I decided to immediate start a third character. As the threats in the game are the same no matter how many players are involved, it may be work allowing the players to have all four heroes in use even if there are only two or three players involved. That, or alternatively boost the health of the characters in play with the spare counters. : The Hero counters have male and female sides, no game effect and I just picked them up randomly, so ‘she’. 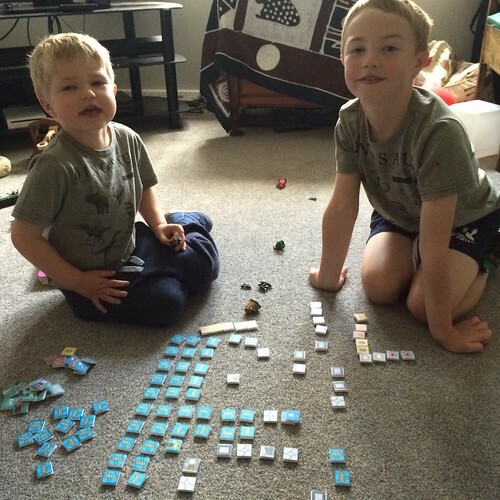 The next game was with Nathan (7) and Aidan (3). Aidan was mainly doing what his brother told him, and was the Warrior. Nathan was a Wizard and I was the Rogue. We had a fun game, playing for the basic ‘find the three relics and escape’ objective. We ended up turning over most of the tiles but fortunately not the boss. I had opted to split the unused Archer’s health between the three of us, and that was good, because we were down to a single health point several times (i.e. dead if we’d played as designed - but we did have a Phoenix feather). Nathan got the idea quickly, and Aidan was happy just playing along and doing what his big brother suggested. We prevailed, just, and they had big smiles on at the end. In conclusion - a fun, quick, cooperative game that understands the essence of the Dungeon crawl and is easily accessible to kids and adults alike. Recommended.